A room with a garden too! 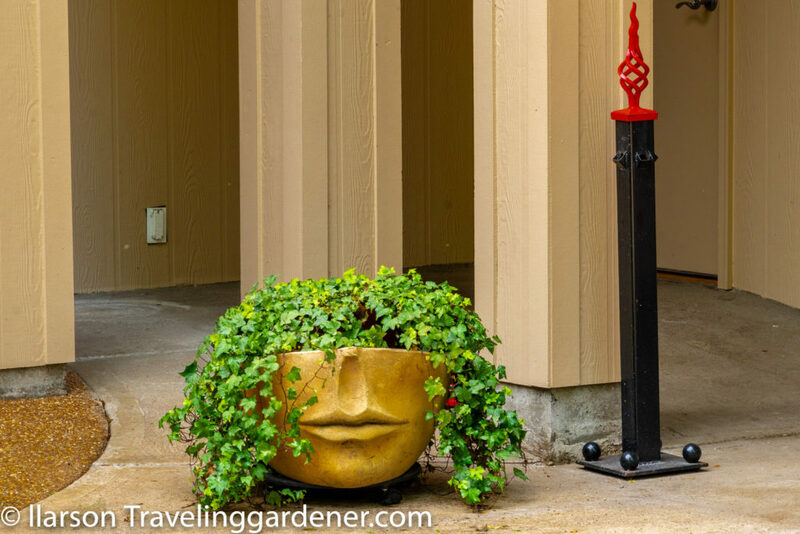 A distinctive pot of ivy graced the front door of the large contemporary house. 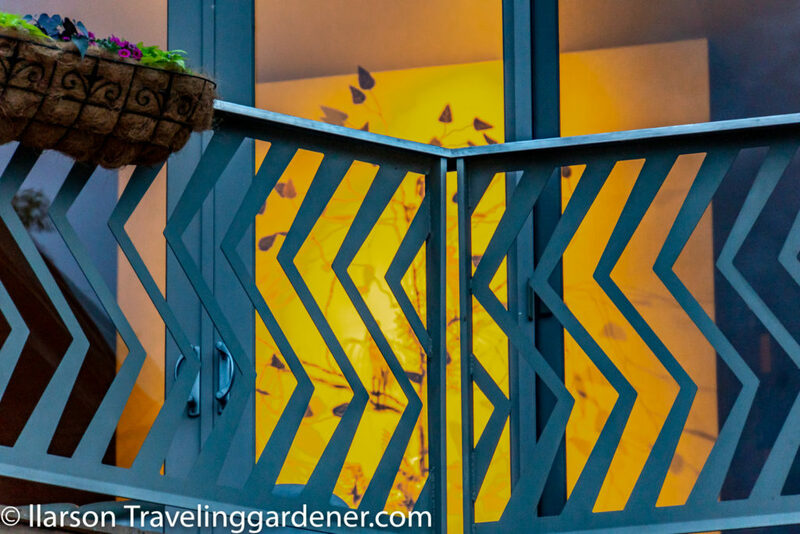 When I travel to visit gardens my husband and I have fully embraced Airbnb accommodations. We’ve traveled to New Zealand, Australia, Canada and many of the US States staying with hosting individuals in a room with a view. 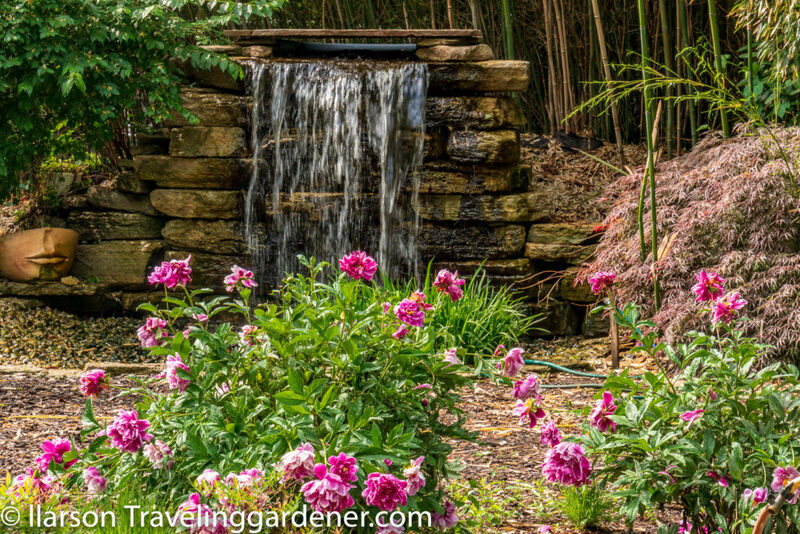 We look for properties with photos of gardens as part of their home since that assures us we have something in common before we arrive. I have nothing but good things to say about this type of travel experience, we meet interesting people, enjoy fantasy real estate both in location and floor plans. We find great surprises. 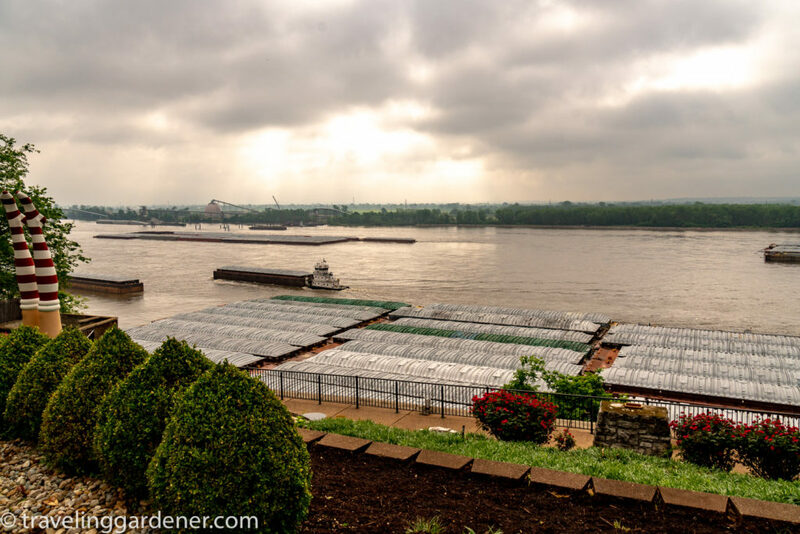 We were in St. Louis for my niece’s college graduation recently and found a property overlooking the Mississippi River with a most intriguing garden. Take a look. We loved the gated entry with the bright red house numbers. 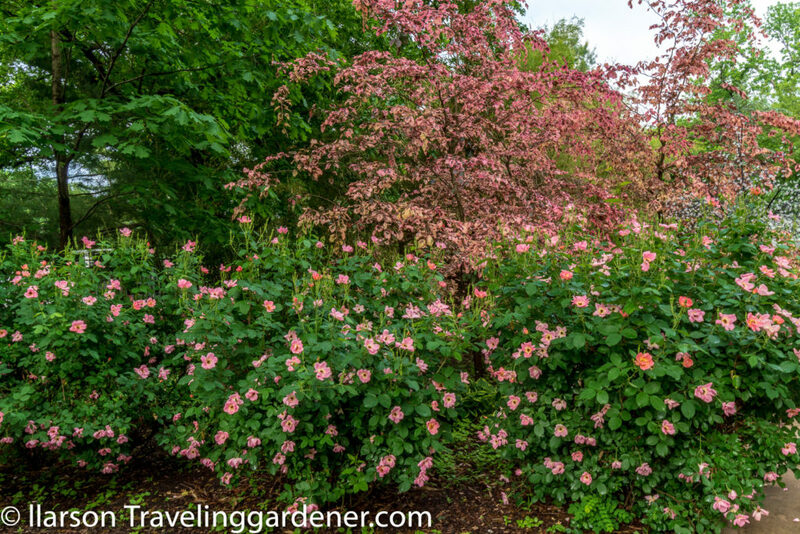 We drove up the long curving driveway past the chicken palace, the waterfall, and the landscape of smoke bush, pink shrub roses, peonies and pink gumtree. 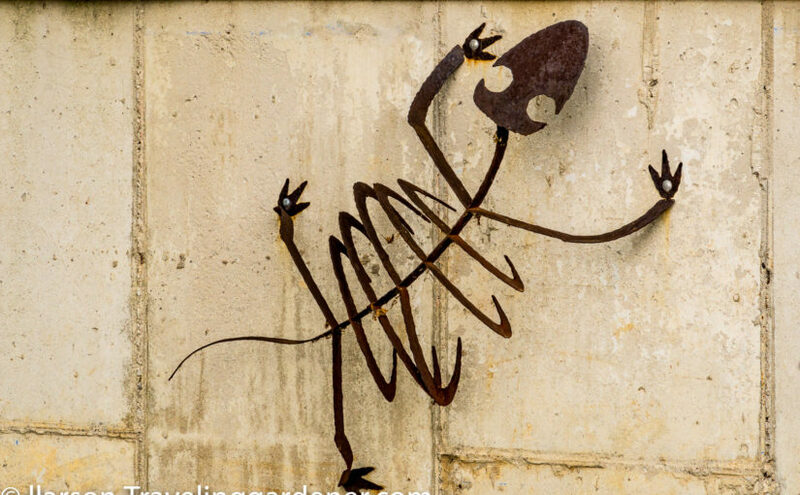 The art collection began to appear with abstract steel sculptures among the tree. 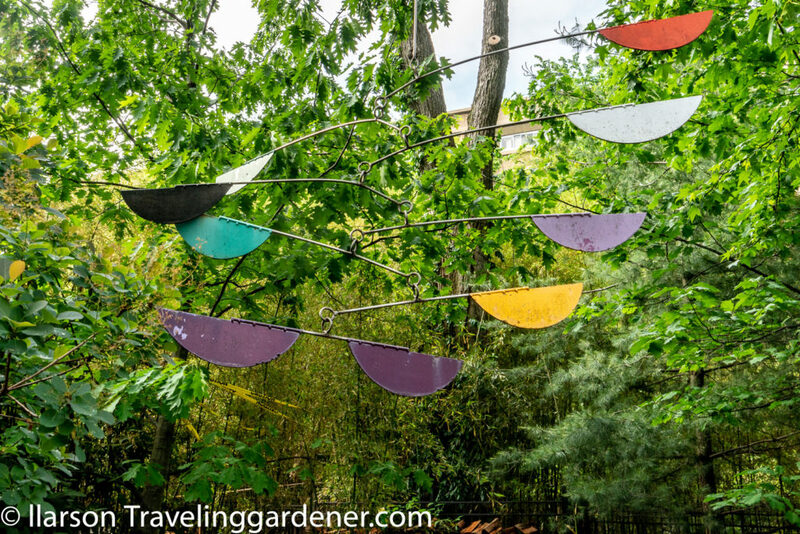 A large, colorful “calderesque” mobile hung from a tree. 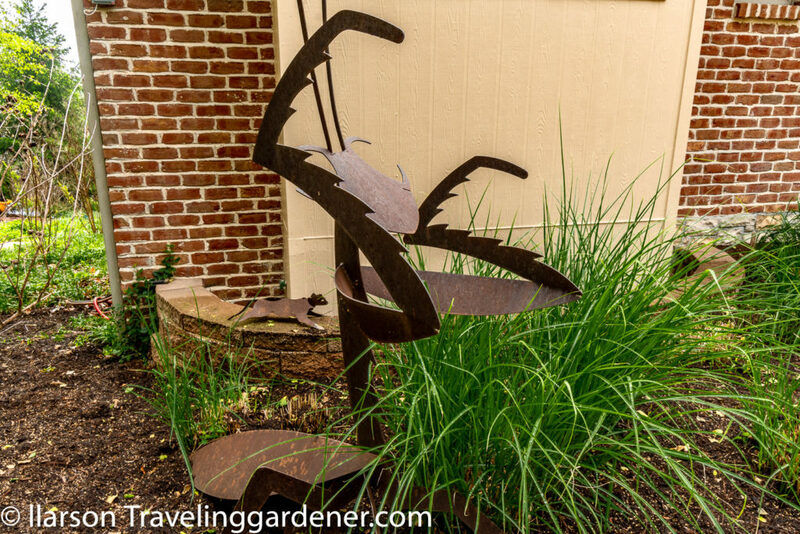 Garden creatures in steel included a praying mantis, lizards, and a dragonfly. There was a monkey on a bicycle among the flowers. Our room was at the back of the home overlooking the river. 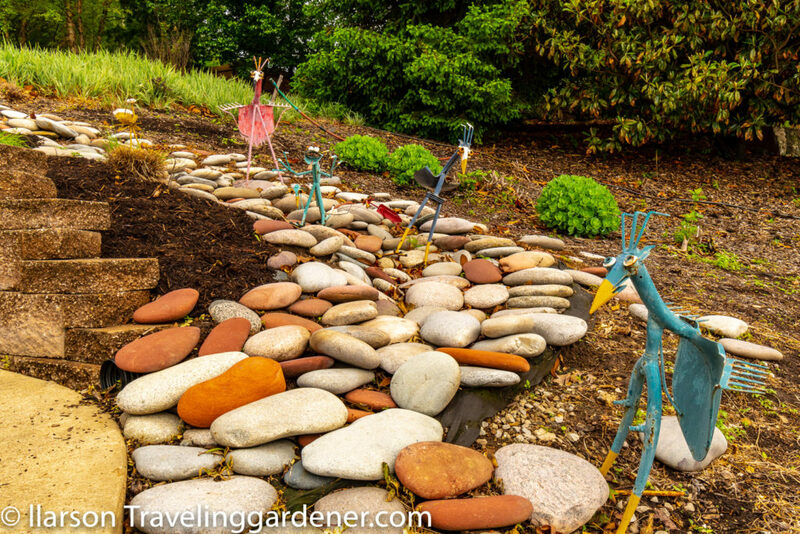 As we came around the corner there was, so far, the most unique sculpture I have found in a home garden. The legs diving into a “pool” of blue stretching high with striped red and white stockings. Obviously a view large enough to catch the attention of river traffic as the barges float by. An amazing sight from any angle. 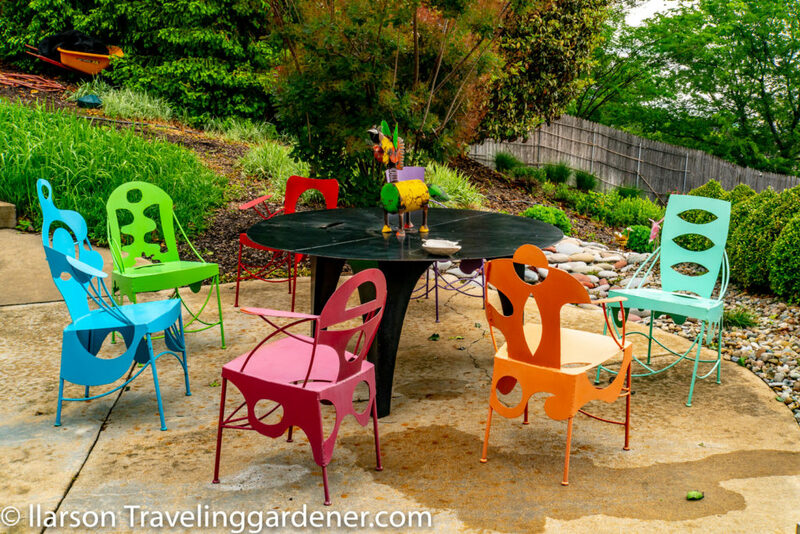 We enjoyed just sitting on the patio at the most distinctive steel table with eight heavy chairs. It is crazy windy in this area of the country so patio furniture has to be durable to stick around. The round table was segmented with pie-shaped steel but it was the chairs that stole the show. Each in a different shape and color were truly a work of original design. The property The Bluffs On Broadway serve as an entertainment venue operated by Mark Widmann. Travel is a privilege and the more opportunities I have to experience the people, landscapes and delights of this world the more I realize how lucky I am. Hope you enjoy sharing it too. 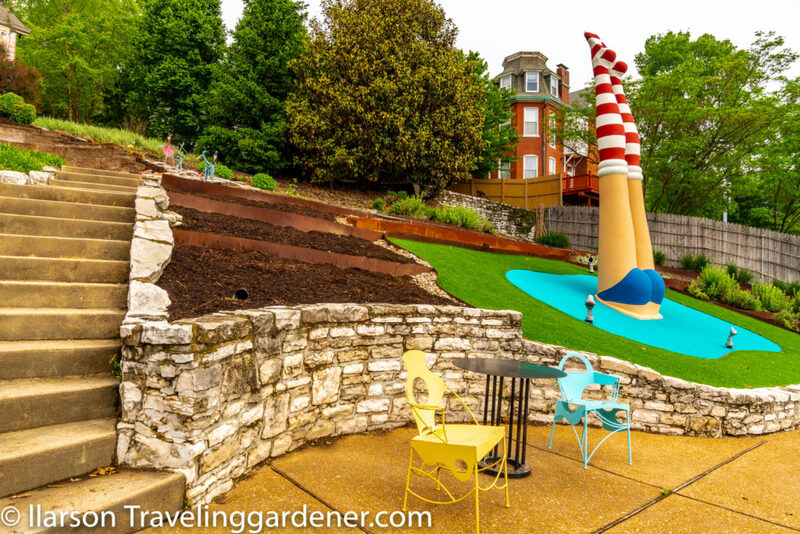 The Legs on the property, as well as all of the metal bugs and the railings on the back of the house, were built by the local St Louis artist Mark Bunch. 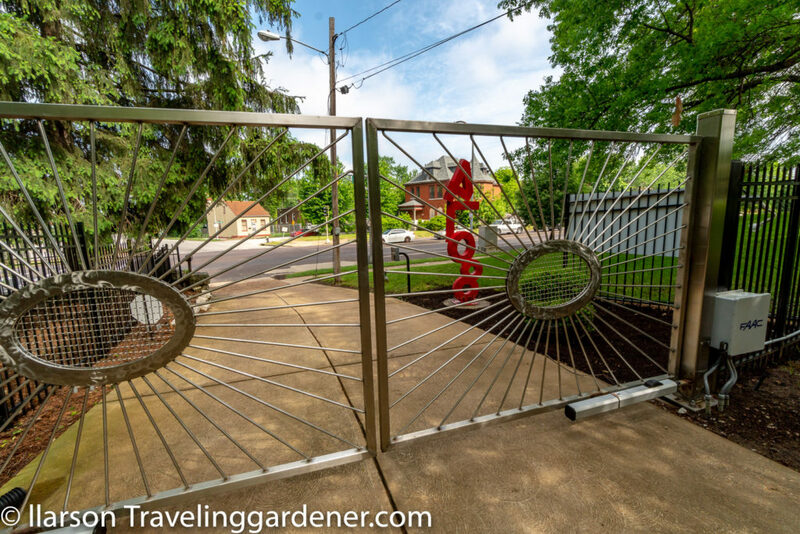 The front gates are an original work of art by the local St Louis artist Robert Michelmann. 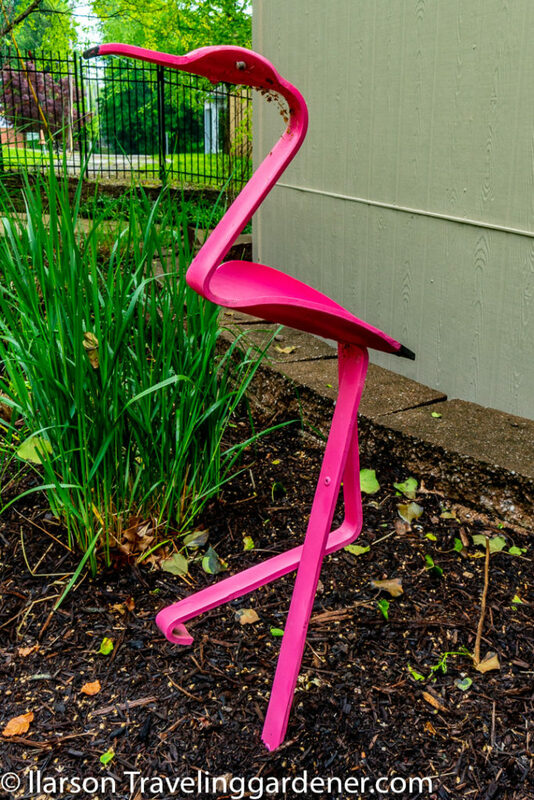 The metal furniture as well as the 9′ tall 4708 South Broadway numbers in front of the house were made by the artist Brother Mel Meyer. The travels of Rich and Linda Larson enrich all who are privileged to read about them. 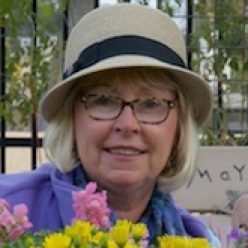 Both of them were fine educators in earlier careers and they are still educating their lucky readers with lovely views, interesting writing, and an underlying feeling about ways to see the beauty to be found in our world. With thanks from a grateful reader. Next Next post: Paul loves to garden . . .